Use the em dash for clarity and emphasis. There is a good chance you have not heard of the em dash. But you must have seen or even used it without knowing its proper name. 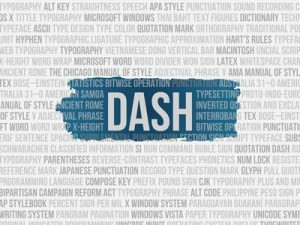 The em dash is a horizontal line that is traditionally the width of the capital letter ‘M’. Em dashes are used to indicate a pause or an emphasis. They often take the place of many other punctuation marks, such as colons, commas, or parentheses. When used correctly, there is a subtle yet significant impact on the sentence. That is why writers love this little punctuation mark. In this blog post, we will look at how to use the versatile em dash. Colons are often used to introduce a list. At times, they put an emphasis on a word or phrase at the end of a sentence. The em dash produces a less formal effect than the colon. We learn three languages at our school: French, German, and Mandarin. We learn three languages at our school—French, German, and Mandarin. Em dashes often replace commas that function like parentheses. In fact, the em dash is sometimes a better option because it brings clarity to a sentence. I collaborated with Angelo, a Sales Manager and a known bully, on the project. I collaborated with Angelo—a Sales Manager and a known bully—on the project. Do you want to draw attention to the information placed within brackets? Use the em dash for emphasis. Student exchange programmes (especially those with an international focus) are a great opportunity for young students. Student exchange programmes—especially those with an international focus—are a great opportunity for young students. As you can see, the em dash is a wonderfully flexible punctuation. But over-use is a problem. It can make your writing unnecessarily cluttered. As a rule, remember to keep the number of em dashes in a sentence limited to two. Yes, em dashes create clarity and emphasis. But too many of them can have the opposite effect. As with all good things, moderation is the key. This entry was posted in Miscellaneous and tagged em dash, English editing, grammar and style, proofreading, punctuation. Bookmark the permalink.